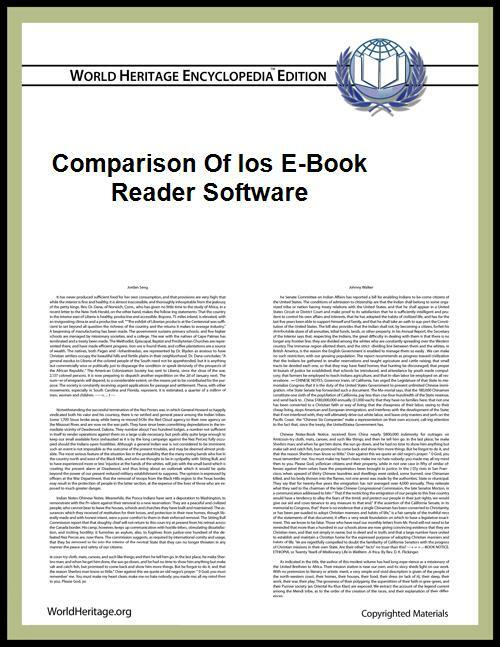 The following tables compare general and technical features for a number of iOS e-book reader software. Each section corresponds to a major area of functionality in an e-book reader software. The comparisons are based on the latest released version. See Comparison of e-book formats for details on the file formats. 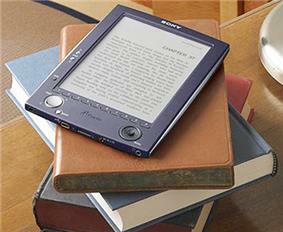 eBook Reader Full Epub3 support for in-book audio and video. Online sync of all bookmarks, highlights, notes and reading position. Import DRM free PDF and Epub files. User created collections for organizing books. Extensive social media support via Facebook. Customizable page warmth and tint. "Deep View" automatically creates name lists, summaries, adds references to (WorldHeritage) articles and pins web pages, reviews, etc... to the book. Specialized font to assist users with Dyslexia. Integration and annotation syncing with Calibre. Export notes, highlights, vocabulary & other user modifications to XHTML and CSV files. Optionally uses the rear camera for "look-through" reading. PocketBook reader Export book info, notes, highlights to mail, sms, Facebook, Twitter. Localization in English and Russian. Single page, dual page or scroll viewing modes. Allows zoom in or out a page via pinch and stretch gestures. Allows zoom to a particular text fragment via double touch. Adjust font size via pinch and stretch gestures (epub, fb2, txt). ShuBook Basic support for Microsoft Office documents (DOC, XLS, PPT) & RTF. The Readmill app, introduced in February 2011, read numerous formats on Android and iOS devices but is shutting down July 1, 2014. ^ "Apabi Reader". Founder Group. Retrieved 2011-12-30. ^ "Blio". KNFB Reading Technology, Inc. Retrieved 2011-10-25. ^ "Bluefire Reader". Bluefire Productions, LLC. Retrieved 2011-10-20. ^ "DL Reader". Datalogics Inc. Retrieved 2010-01-16. ^ "eBookMobi". Vu Tien Thinh. Retrieved 2011-10-20. ^ "i2Reader". Unsanity. Retrieved 2011-10-20. ^ "iBooks". Apple. Retrieved 2011-10-20. ^ "Kindle". AMZN Mobile LLC. Retrieved 2011-10-20. ^ "Kobo eBooks". Kobo Inc. Retrieved 2011-10-20. ^ "KyBook". Konstantin Bukreev. Retrieved 2013-10-10. ^ "Marvin". Appstafarian. Retrieved 2012-12-05. ^ "MegaReader". Inkstone Software, Inc. Retrieved 2011-10-20. ^ "PocketBook reader". Obreey Products. Retrieved 2014-02-16. ^ "ShuBook". Ambibma Ltd. Retrieved 2011-10-20. ^ "Stanza". Lexcycle. Retrieved 2011-10-20. ^ "uBooks". NIX Solutions Ltd. Retrieved 2011-10-20. ^ Bond, John-Michael. "Readmill is closing its doors on July 1, 2014". The Unofficial Apple Weblog.